Last week Barry and I drove to a Baraga-Ontonagon high school basketball tournament, about an hour from where we live. We found ourselves ‘way back in the Upper Peninsula (Yooper) backwoods, re-living a family memory from the early 1980’s. Barry kept telling me to write a blog about our experience. I kept telling him, “Please, YOU write a blog about it!” Finally, he agreed. Please welcome my latest guest-blogger, my dear husband, as he shares our latest adventure. P.S. He’s publishing it in his column in our local newspaper, the L’Anse Sentinel. It was September, 1979. We young Lower Michigan emigrants landed plop-dab on the old Mustanen family dairy farm on the outskirts of Pelkie. The rented farmhouse was our first UP home. Landlords Ned and Toini Moberg watched over us. I had won a tough interview process for a L’Anse Sentinel reporting job over a talented woman writer who chewed tobacco. Kathy was hired for an office position at Baraga County Memorial Hospital. In our early 20’s we were unknowingly laying the foundation to becoming Yoopers. Among Kathy’s family in the distant “Thumb” of the Lower Peninsula we were something of celebrity, or perhaps just nuts. Her mom and dad knew very well this region from their dear friends, Don and Ann McConnell. They visited the deepest, darkest, buggiest and snowiest woods of rural Mass City at least annually. Don is related to the Miilu clan there. And so it was, we young upstarts were almost neighbors. 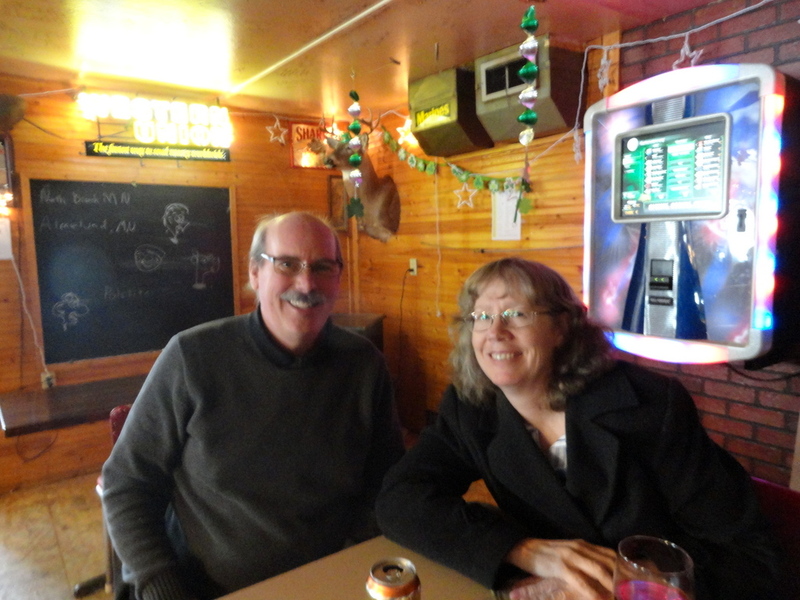 K’s parents, Joanne and Dale, soon made the trip north with the McConnells. It wasn’t long before we were at the Miilu A-frame camp, playing cards flying across the tables, a barrel wood stove and gas lamps adding charm and heat. I have a distant memory of eating bear. . .
And for evening entertainment we went to the only show in town–the old “Art’s Bar” in beautiful downtown Rousseau. Art Moilanen, owner of the bar in the 60’s and early 70’s, had the whole place jumping, thumping out Finnish polkas and waltzes on his squeeze box. I think Don played, too. Ann did her best to teach me the highly complex hop-1-2-3 footwork required of the polka–but it must have been some Southern Comfort and suds got in my way! It was quite a night a long, long time ago. Cheap date and a ballgame. . .
What goes around comes around–eventually. It goes without saying that K will accompany me on these long, tedious cross-country soirees if any of the above are included: dinner and a liquid refreshment; a stop at the food co-op; or a coffee shop. The more stops the merrier. You can guess where we ended up for a pre-game dinner and pit stop, since we were headed in that direction anyway. 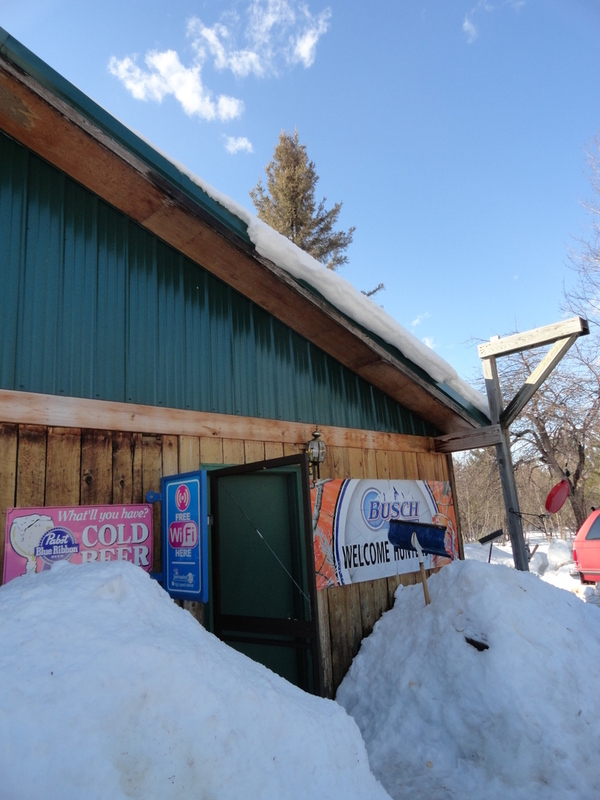 Angie Foley, new owner of “The Legendary Rousseau Bar”, has been advertising in the L’Anse Sentinel Dining and Entertainment section. Hence, we ambled around the snowy, slushy countryside of suburban Mass City searching for “Downtown Rousseau”. I believe we found the industrial hub of the city–the railroad siding which was humming with log trucks rushing in load after load on the day before road restrictions went on. “There it is,” Kathy said as three pick-up truck butts stuck out beyond the big snow piles. Snowmobiles were stacked up on the banks. The Legendary Rousseau Bar we had visited so many years ago. . .
Out of place, me dressed in a leather jacket and black pants, and K in her tailored gray wool coat, we walked on in. The door was stuck half-way open on a frost heave. No one seemed to mind. “What’d you do, leave your helmets on your sleds?” one of the boys joked. We met Angie and introduced ourselves. It was a grand old time. 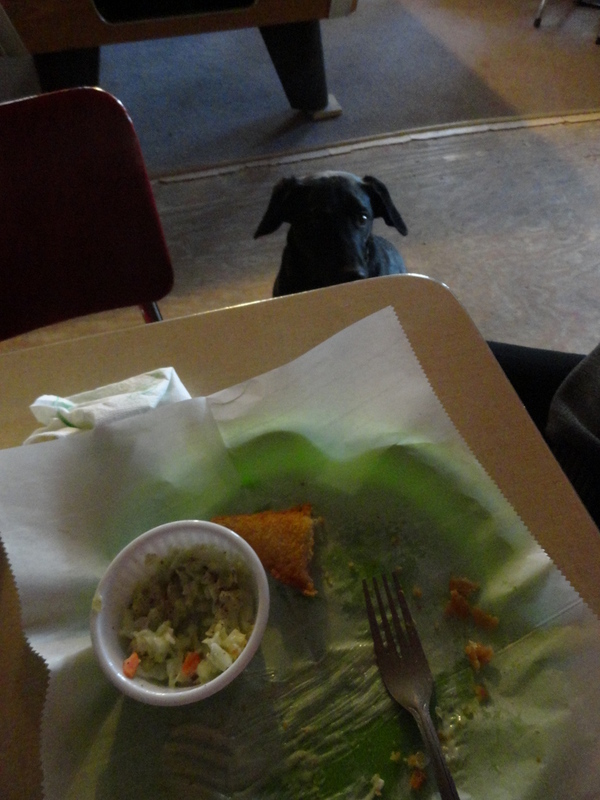 The perch and cod were tasty, the company fine and the ambiance 100 percent backwoods Yooper. It’s still The Rousseau Bar we remember. 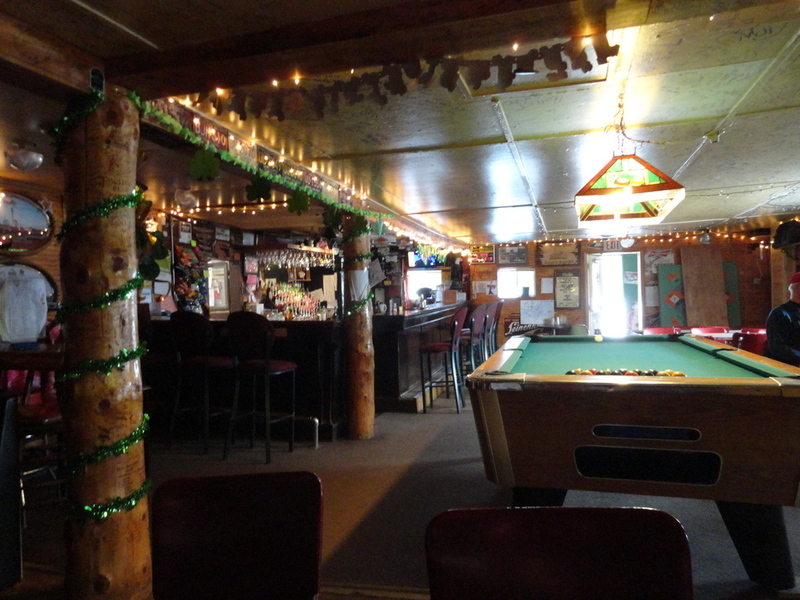 This entry was posted in March 2015 and tagged Art's Bar, family, guest blog, L'Anse Sentinel, Mass City, memories, Rousseau Bar, Upper Peninsula. Bookmark the permalink. Why thank you, LouAnn. Barry will appreciate your comment–from one newspaper columnist to another! A wonderful and fun story! Now I know about Yoopers, which I’ve never heard of before. Life as depicted in the ‘backwoods’ in this post reminds me of a TV show I used to love, Northern Exposure. Welcome Barry! Thank you for sharing these wonderful memories of you and Kathy at the beginning of your Yooper life ❤ I always love hearing about life in the northwoods because it has been my lifelong dream to live like that. You and Kathy are such fun northwoods people! Brenda, thank you so much for your comment. (This is Kathy. I am acting as Barry’s Yooper secretary.) 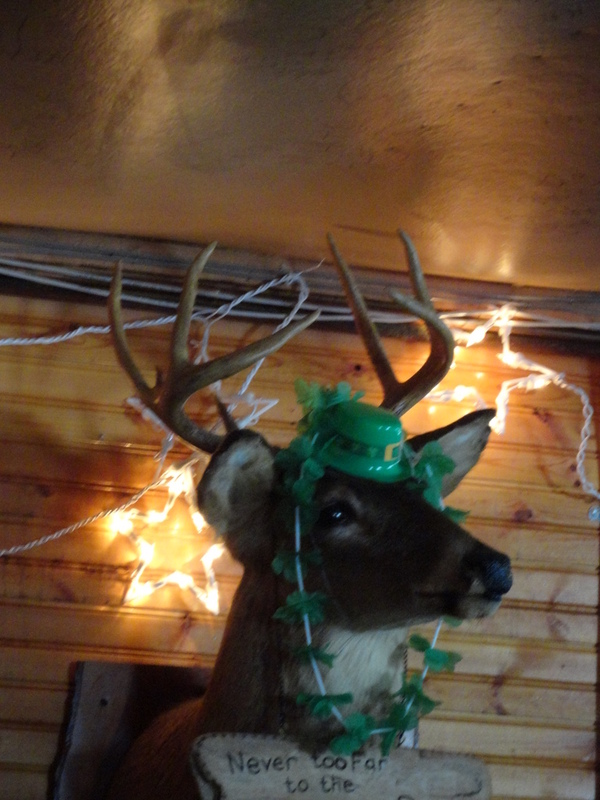 Glad to have given you another glimpse of Life in the North Woods! Oh I love you guest author. He sounds much like the publisher of our local weekly, as he recounts his trips here and there. This was fantastic, I feel as if you took us all along. Lucinda, thanks for taking the time to make this comment. Barry will appreciate that you liked his story. And I appreciate what you shared so much! Finding those touchstones to your past is fun when they turn out to be much as you remember them. So often they are not. But the search is worth it anyway. Thanks for a great story! Esther, it took us a while to reorient ourselves when in the bar. We had to try & remember little details like “Where did Art play that accordion?” and “Where did we dance?” You are so right about when the remembering turns out to be good. Glad you liked Barry’s story. Welcome, Barry, and thank you for the story! Dear Barry via Kathy. Wonderful multi-faceted story of a young couple in love discovering the joys of living back woods and the bars, and the not-so-young couple in love who STILL love the back woods and frequent a funky Yooper bar (but this time, no bear). I loved reading about this part of the country that is romanticized here, but that’s because it centers around a loving couple. Dear Pamela via WordPress. Gosh, this sounds so romantic! I think you must be a romance writer, aren’t you? Bare (bear?) with me. I love that you enjoyed this. Sincerely, Barry’s Secretary and General Manager and a Writer, as well. I loved this piece. Really captures the essence of some of my favorite places over the years. 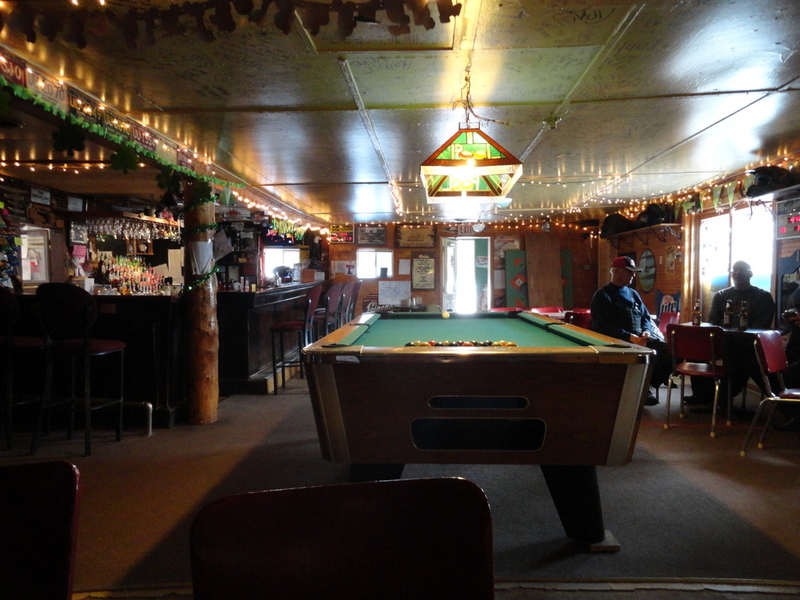 Yes, a combination of Sicily, Alaska, and some of the best sawdust-floor bars I ever visited in Texas. A talented, tobacco-chewing female writer, bar dogs, and truck butts — all had me laughing out loud. Then there is the tender story of two of my favorite Yoopers, and their journey from then to now, come full circle. Wonderful picture of both of you, and the other shots “take us there.” Thanks for this today, Barry and Kathy. What a treat! Susan Dee, thank you for stoppin’ by to put some of your wonderful words (reminding me of floors sprinkled with peanuts in Lower Michigan) in this here blog post. I am now also very curious what tobacco-chewing female my husband is referring to. (Never end a sentence in a preposition, my mother once said.) Thanks again for the lunch last weekend! You are da best, you fellow Yooper! Barry’s secretary, please tell Barry I loved his article. Makes me want to come up there and visit the quaint little place in the woods. Think I will wait for the snow to melt though. Ah -ha! Now you need to reign Barry in more often. You know for those times that you take an extended vacation from your blog. I very much enjoyed Barry’s writing and I got more than my fill, er, I mean feel for the yooper part of UP. That bar sounds homey especially with the dog and the door that was left open? I have no words except that all you UP folks are dyed in the wool snow lovers or maybe not! You are so right, Yvonne! I TOLD him if he wanted to see a blog–HE should write one. And he did, thank goodness. Glad you enjoyed! I loved reading what he wrote, too. P.S. what he didn’t tell was that the dog kept eating his shoe. It’s a good thing he has a foot left! That’s too funny. Hope his shoe is wearable..
Haha! I have a hard time picturing your adventure in 1979 with Nanny & Papa. Why didn’t you eat bear this time!? Kathy — I thoroughly enjoyed reading Barry’s post. The man’s got S-T-Y-L-E! Why thank you, Laurie. I so him reading comments this morning and he was grinning from ear-to-ear! Fantastic piece – I felt as if I were right there! Thank you! Best guest blogger ever! Gosh, Barry should be a writer! 🙂 I’m so impressed y’all can take those northern (I mean REALLY northern) winters! But it sure gives you time and space to brew up the best writing! Cute. I’ll bet those memories came flooding back when you walked in the door. It didn’t look like it changed at all. Awww…look how cute you guys are! Isn’t it fun to go back to places you visited so many years ago. I moved to Houghton in 1979! But I left in 1985, you were stronger and stayed. What great memories you two have of a lifetime of adventure. Thank you so much, Stacy! Happy endings are the best of all. Glad you stopped by to read my husband’s guest blog. How terrific was that! Great job Barry and great suggestion Kathy! Thanks for reading, Suzi. I just responded to your email. P.S. Doesn’t a Lake Superior fish fry sound good right now? I missed this update from a couple months back, so glad I checked in! Love these spots full of character and charm, with no pretense. Just wanted to stop by and wish you a great summer Kathy (it will get warm someday 😉 )! Inger, you are so thoughtful. Thank you for stopping by to say hello. You are 100% positive it will get warm–and stay warm? I hope so! It is pretty comfy today at 70 degrees, but I would like to place an order for the upper 70’s or low 80’s for a spell. You too? Nice writing, Barry! Fun story! Looks like you have taken some time off, as well, Kathy. I’m trying to return to blogging, so stay tuned. Going on a two month RV trip with my nearing 90, former flamenco dancer Godmother this summer in a 37 foot RV. Kid you not. We will be in the Upper Peninsula, but not near you, I don’t think. Maybe we will see you. Maybe we won’t be close enough. Either way, take care, my friend. Why Kathy McCullough! How nice to see you! You’re returning and I’m backing out. (Well, have been backing out since last fall…) Sounds like a fabulous RV trip!! Oh my goodness, it would be so fun to see you if you end up in the U.P. Please keep me informed where you might be. If you were in some near vicinity, might even drive over to say hello. Happy travels my friend!